This may well be the first time anyone has ever seen a white fisher. The small carnivore is typically dark brown to black as it prowls forests across Canada and dips into parts of the United States. 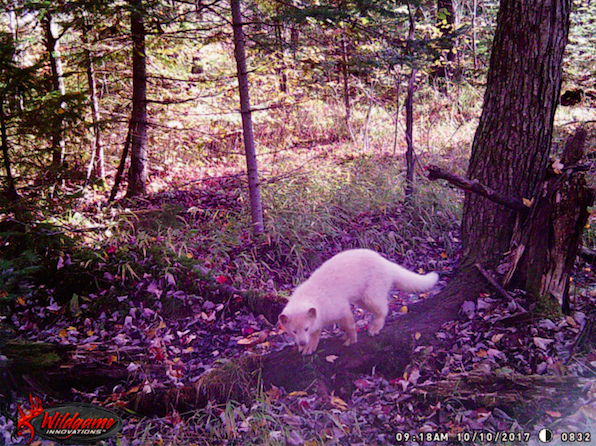 It was in Wisconsin, where camera traps set up as part of a research project in the fall of 2017, captured the unusual creature — a leucistic fisher. The research, recently published in The American Midland Naturalist, described the rare-looking member of the weasel family that was snapped on the morning of Oct. 10, 2017. The authors, Lucas Olson, with the Department of Forest and Wildlife Ecology, University of Wisconsin-Madison, and Maximilian Allen of the University of Illinois, Illinois Natural History Survey, describe leucism as a genetic abnormality of partial loss of pigmentation. It makes individuals look partly or entirely white. It’s not the same as albinism, which afflicts the skin, nose and eyes. But both leucism and albinism are rare in the wild. Of course, rare or unusual hues does appeal to hunters and poachers, which can further decrease their numbers in a variety of species. Researchers are always keen to learn more about these unusual animals. “It is important for biologists to document abnormal coloration among species of birds, reptiles, or mammals to help provide insights to the underlying causes of these phenomenon and their prevalence, distribution, and impacts on survival,” the researchers add.